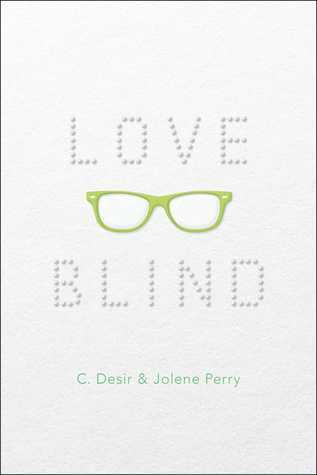 We're excited to have Jolene Perry and C. Desir here to tell us about their collaboration LOVE BLIND. Ladies, what was your inspiration for writing LOVE BLIND? The inspiration for LOVE BLIND came from a real life story, involving very different characters. We loved the idea of playing with two people who are good friends, who should be more, but never understand that at the same time. Christa had Kyle's character in her head from the beginning, and Jo asked, "Are you cool with Hailey going blind? I'm friends with this very cool teenage girl who is going blind, and I want to write that." Obviously, Christa said yes. There's a silly scene with a very large spider that Jo pushed hard to get in because she needed a FUN scene. But probably our favorite is one of Hailey's first visits to Kyle's dorm. It's done in Kyle's point of view, but Christa sent the scene half done to Jo and said, "This is too important a scene for me to write on my own." Eleanor and Park is my first thought, simply because we deal with some darker topics, but the characters are so fun to watch together. How long did you work on LOVE BLIND? This is a tricky question to answer. We had our first draft done in less than a month (benefit of two authors), but we both believe in time away from a manuscript before working on it again. We sold it within six months of finishing our first draft, but due to other titles, our release day was pushed back considerably. Working with a partner means that you really push yourself hard. There's always something to be learned when we force ourselves out of our comfort zone. What do you hope readers will take away from LOVE BLIND? The hope is that readers will walk away from the book, and think to themselves, "You know that thing I've always meant to do? I'm going to go do that right now." The road for everyone is a little harder than we think. Both Christa and Jo have written books that will never see the light of day, and that's okay. We've also written books that may one day find their way into the world. We both have a few completed (but not finished) projects on our hard drives. Jolene wrote her first book by accident. She just started writing this scene, and then what came before and then what came after, and when she hit page 100, thought - I'M GOING TO WRITE A WHOLE BOOK! And she did. It was a terrible book, but after that moment, she knew she could write a whole novel. The other thing that publishing has taught Jo, is that putting books into the world is much more about the journey than the end result. Christa gets up horribly, painfully early, and writes for 1-2 hours a day. It's rare she writes outside of that. Jo drops kiddos off at school and spends the day writing. She works anywhere. With music. Without music... The mood shifts with her and shifts with the project. Love writing enough that you'd do it whether you got paid or not. And learn patience. Also, find other writers. You'll need them. At this moment, Jolene is working on edits for her book, A FOREVER THING, which comes out Fall 2016. It takes place in a funeral home, and is her ADDAMS FAMILY meets a JOHN HUGHES movie. The title could change, since her cover isn't done yet. Jolene Perry grew up in south central Alaska. She has lived in a cabin on a lake island, sailed the Bahamas, taught middle school and high school, and she married the guy she kissed on her his school graduation night. Her previous novels include OUT OF PLAY and THE SUMMER I FOUND YOU. Jolene lives with her husband and two children in Alaska. Have you had a chance to read LOVE BLIND yet? Have you ever written with a partner? Do you love writing enough that you'd do it whether you got paid or not? Share your thoughts about the interview in the comments! This sounds like a lot of fun (plus, I love Jo--she's amazing and so supportive of other authors).